Q: I have a question about noise. I live on the ground floor of a four-story “luxury” apartment community. 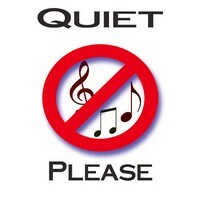 We have a “quiet hours” clause written in all of our leases that states residents must be quiet from 10 p.m. to 6 a.m. The tenants who just moved in above me, a family of four, make a lot of noise between 11 p.m. and 2 a.m. almost every night. What do I do if the landlord is unwilling or unable to stop them from waking me up in the middle of the night? I usually have to call security three nights a week. I have more than six months left on my current lease, but do I have grounds to break my lease early? Can I ask that they be given an eviction notice? Do I have grounds for breaking the lease early without penalty? For the last two months I haven’t been getting much sleep and I don’t know what to do. A: One of the most prevalent complaints received by landlords is about the noise level created by another tenant. Such complaints are very challenging and a source of frustration for both landlords and tenants. A certain amount of noise is expected and must be tolerated when living in a multifamily apartment community. However, tenants need to be courteous and considerate of their neighbors. Noise complaints are one of those issues that I believe require an escalating level of response. Ideally, just contacting your neighbor directly and asking them to be courteous should resolve the matter. But if that doesn’t work, then you were correct in contacting the landlord to see if he can intervene. The landlord already has a “quiet hours” policy so he certainly is aware of this issue and seems to agree that excessive noise is unacceptable. The first step by the landlord or onsite property manager would be to make a phone call and ask the tenant directly but politely to be sensitive to others and keep the noise down as much as possible. If that doesn’t work, then the landlord should make a written formal request of your upstairs neighbor to cease and desist from any activity that could be disruptive. This written notice should be on a proper legal Notice of Breach of Lease form and cite the failure of the tenant to abide by the “quiet hours” policy. If all else fails, you may want to contact your local municipality to see if it has noise ordinances, and make a formal written complaint. Many times these policies will require more than a single incident of excessive noise before they will take action. I have also seen municipal policies requiring that at least two or more neighbors be willing to file a formal complaint before the municipality will formally investigate the alleged noise violation. If you are not able to resolve the issue with any of the above methods and are still interested in breaking your lease, then you should talk to your manager and point out that you believe the landlord has breached the lease agreement by failing to enforce their own “quiet hours” policy. You may find that the landlord is agreeable and will let you mutually agree to break the lease. However, if the landlord takes the position that you cannot break the lease, I would suggest you contact a local tenant-landlord attorney who can review your lease and will know the local laws and can advise you on the best way to proceed. A lease is a formal legal document and you should be very careful and get proper legal advice before deciding that you will simply not honor this legally binding contract. I know that many tenants will just move out and are thoroughly convinced that the landlord has breached the lease but could find that the landlord disagrees and takes them to court seeking the balance of the lease payments — and then the tenant has to prove that the lease was indeed breached, and it can be difficult unless you have proper evidence. I know you have video-camera evidence but that could be questioned in a court of law, so I feel it is much better if you have third-party verification of the noise complaints from either local law enforcement or a local municipal agency that handles noise complaints. You indicate that you have contacted the apartment community’s security department several times per week so you can also see if they have been documenting your complaints in writing and see if you can get copies of these reports. I have also heard that some tenants have successfully pursued small claims court actions directly against the other tenants for excessive noise. While this may be appealing on some level, it is certainly confrontational and could create a very stressful living environment. I would not recommend it, as you shouldn’t have to take the action yourself but should get the cooperation of your landlord or local code enforcement. See Robert Griswold’s feature, Is $450 Cleaning Charge Legal?